In October 1984, this observer had the fortune of visiting the World Trade Center just a few years after the WTC was completed (1973). I did not visit the Twin Towers before returning to Yemen in 1977, as I was living in New Jersey then and was busy with my university studies. I was invited to attend a seminar on Development Loan and Credit Disbursement in the World Bank Headquarters in Washington D.C. As a former long time resident who lived and studied in New York City (8 years – Age 10 to 18) and nearby Teaneck, New Jersey (6 years), I could never dispel the often felt notion (even to this day) that I certainly did have all the makings of a cosmopolitan New Yorker. Thus, when I visited the United States again after an almost 7-years lapse since my return to Yemen after having finished most of my education years (including Graduate School) in the good old USA, I was very determined to squeeze a visit to New York City in my tight itinerary. I erroneously thought then that the WTC was the only major attraction in New York, which I heretofore had not seen or visited, even though it was completed before my return to Yemen. To my surprise, the WTC was not the only architectural splendor that has come to adorn the Manhattan Island skyline. Skyscrapers had taken over almost a third of the area of the financial and business capital of the world that Manhattan Island was and still is to this very day. New skyscrapers had risen by the scores reaching to the southern periphery of Central Park (59th Street), whereas the Empire State Building on 34th Street was the farthest they have reached when I left in the late 1970s. Most skyscrapers were to be found in the southern peninsula jotting out of Manhattan Island. Even 42nd Street and the Times Square area where undergoing a change of façade, as steel and glass giant cubicles occupied the grounds where once many of the concrete, stone, granite, brick and columns edifices that had outworn their 19th Century usefulness. I reflected to myself at these magnificent changes and set them against the relatively very modest architectural strides that the Middle East area was achieving after the oil boom of the 1970s and early 1980s. I could not help but also reach the contention that even Europe could not even come close to having reached such impressive architectural feats. Indeed New York City viewed by the observer then (and probably now as well) as the unrivalled metropolis of urban metamorphosis in the world. 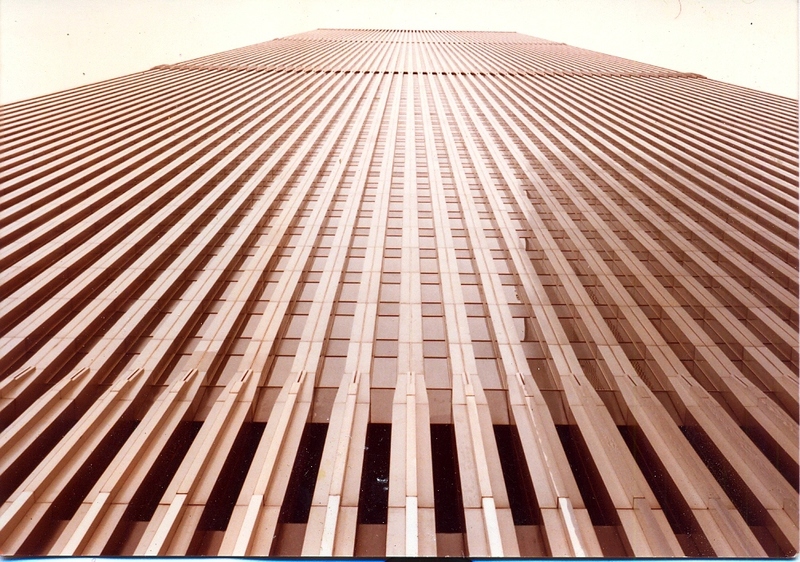 But the visit to the WTC was indisputably the real eye opener to the keen observer of urban architectural finesse. Almost at the start of viewing the WTC from the outside, at a fair distance away from the twin tower site, I was awestruck beyond description. I stood there taking in all the magnificence and flair of this pair of structural engineering unequalled anywhere in the world then. Even to this day the WTC would probably still rank as the unmatched architectural achievement of all times, in terms of size, aesthetic geometric design, volume of materials, and work space capacity, etc and yes even the number of elevators (100). As I moved slowly towards the two towers, I knew I was looking upon the apex of human functional, aesthetic and architectural genius, no matter what angle of view that one tries to digest of the rapidly increasing area the towers occupied in the sightseer’s field of vision. The observer could only conclude right then and there that only the United States of America was worthy of such spectacular human intellectual, industrial and aesthetic structural achievment. The WTC was then absolutely the marvel of human intellect and artistic flair. Architecture is a magnificent art indeed, for it combines the practical and logical workings of the human mind and the aesthetic wanderings of the infinite realms of the imagination. In the appreciation of beauty comes the inherent desire to want to believe that, with all the glory and magnificence of the workings of the human mind in its practical and down to earth applications to the infinite realm of the aesthetic expanse of human intellectual and artistic design, God indeed has been generous to man by availing him such a realm for almost unlimited structural and artistic genius. On September 11, 2001, this observer was watching cable news on television, awaiting for my usual late lunch to be served. The breaking news flashed then of the ignominious unprecedented “attack” on the South Tower of the WTC. One could see views of what mistakenly appeared to to be a fire that perhaps could be controlled by a few extinguishers and in fact nothing seemed startling at that point, especially as the actual hit by the airplane was not seen except by people in the area. Trying to digest the news that a jet airplane rammed into the building near the 100th floor and stayed inside the floor it hit almost seemed ridiculous then (and sometimes still remains hauntingly so). About 20 minutes later, as it happened, this observer’s eyes were suddenly locked in on another plane still in the air and speedily heading towards the WTC as it probably was somewhere in the vicinity of the sky above the Plaza Hotel (59th Street Central Park South. It just seemed out of the realm of human mental absorption that such airplane missile sniping could actually occur in the most defended city of the world, when viewed in the context of American superpower might and magnificence. But the horrific maneuver of the second jet and sharp turn towards its intended target on the Northern Tower was enough to shake every living cell in the observer’s body. Suddenly it was clear at that most shocking moment that has ever crossed this observer’s life that the human eyes were not just witnessing any accident or bad pilot’s judgment at all. A murderous crime against humanity was unfolding in the greatest city in the world. The world was being launched into a new era of human history that had all the markings of distressingly evil and ungodly (with a capital G) forces at play. This kind of an attack was, by its complexity, sophistication and intolerable disregard for the lives of innocent people, to carry with it innumerable messages that indeed humanity has forgotten itself again. The world was now being led to forget all the moral strides mankind has been blessed with, either through Devine Revelations, or through the struggles of thousands of people throughout history, for which millions have been sacrificed or willingly gave their lives so that human beings succumb to sound moral principles by which to regulate how human beings interact with each other, notwithstanding their race, color or national origin, as well as religious persuasions. This observer remains to this day awestruck by the ugly thought that men could actually conceive of such a horrible murderous attack against thousands of innocent lives, let alone work to conjure up such a heinous and inexcusable act of mass murder. One is absolutely convinced that such a horror as 9/11 will always be viewed by all decent men and women of every creed, nationality, religious beliefs as an unforgivable crime not just against the thousands of innocent victims, who lost their lives on that most tragic of days in the history of mankind, but a crime against all human beings of the world, since the WTC itself was a small international community of its own. People from all the corners of the world worked were duly represented among the thousands of people who worked or were among the thousands that daily visited the giant towers. That criminal attack on the World Trade Center and the Pentagon in Washington, D. C. was a sad omen that men are still willing to go to great lengths to defy all the moral fiber instilled in human conscience by Devine Ordinances, human legal foundations and international conventions , as well as the obvious lessons of history that peace must prevail in this planet, if mankind is to be spared the horrors of a real doomsday, with all the stockpiles of nuclear armaments existing in this world, and if hunger, deprivation, oppression and injustice are to be eliminated, thus ending all reasons for human conflict, greed, jealousy and arrogant chauvinism. Terrorism has come to be viewed as the No. 1 enemy of mankind and has come to represent the biggest challenge facing the International Community, as a whole (rich nations, poor nations, developed countries and those still trying to meet the subsistence needs of their people, democracies, dictatorships, etc.). Even with the entry of a new millennium, the world is still perplexed by this phenomenon to the extent that there are still differences among world leaders, academicians, legal and criminal experts, etc. as to what should constitute terrorism. However, there should never be any reasons to think that the horrible attack of 9/11, against two of the most important symbols of American ingenuity and might respectively, could ever be dismissed as indeed being the embodiment of criminal terrorism, that certainly is unjustified by any religious, legal and sentimental rationale or for the primitive suggestion of grievous revenge. As Moslems, we are of course obliged by our religious teachings to condemn outright any infidelic notion that the attacks of 9/11 have anything to do with Islamic doctrine, principles or causes. On the contrary, Moslems do consider such attacks and all similar acts of murder of innocent human life or lives as anathema to Moslem moral foundations, that place so much value on human life [The Quran says: “Whosever kills a (single) human soul, without due cause (self defense), is tantamount to the killing of all human beings!” This was multiplied by 3,500 times on that tragic day of 9/11. We as sincere Moslems are bound to categorically condemn those attacks and express our deep condolences to the families of the victims, of all religious persuasions, as well as the 400 Moslems, who were reported to be among the dead or missing victims of this monstrous and unforgivable crime. May all their souls rest in peace, and may all the criminal perpetrators of this heinous crime against humanity be brought to justice and accorded their maximum due punishment accordingly. This entry was posted in Uncategorized and tagged 9/11, Moslem Condemnation of Terrorism, Moslems, Murder of Innocent People, Non-Islamic, Terrorist Attack, Twin Towers, World Trade Center, WTC. Bookmark the permalink. Normally I don’t learn article on blogs, but I would like to say that this write-up very forced me to take a look at and do it! Your writing taste has been surprised me. Thanks, quite great article. Yhank you. We will write mpre oftem. Thank you very much for your feedback, which is highly appreciated. Hi there, You’ve performed an incredible job. I’ll certainly digg it and in my view recommend to my friends. Thank you very much. I appreciate you taking the time to let us know your opinion.